Mrs Robinson, who is also a former UN High Commissioner for Human Rights, will speak on the topic of People First, working together for a strong, just and inclusive society. joined by other key speakers including journalist and author Stan Grant, to discuss how governments, business and people can work together to create strong, just and inclusive societies with the wellbeing of all citizens at its core. The speakers will address the question “If we address inequality and focus on social inclusion will we create more resilient cities?” and speak about how future prosperity is a shared responsibility; we need global effort and local action. The speakers, along with public input, will help guide the City of Sydney’s Social Sustainability Policy which is due to soon be released for community consultation. The MC for the evening will be former ABC radio presenter Adam Spencer, and other speakers include Sydney’s Lord Mayor Clover Moore, economist Richard Denniss, author Narelle Hooper, former AFL commissioner Sam Mostyn and lawyer Deng Thiak Adut. In 2002 the Sydney Peace Prize was presented to Mrs Robinson. 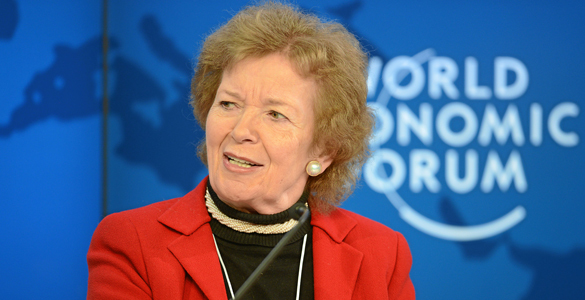 “Mrs Mary Robinson has been chosen for her consistent support of the vulnerable and the disadvantaged the world over,” said Emeritus Professor Stuart Rees, director of the University of Sydney’s Peace Foundation at the time. Mrs Robinson emphasised how important human rights are. “I have always urged the importance of human rights in resolving conflicts, and its role in peace-making and peace-building. “Given the significance of the Sydney Peace Prize, I feel that in honouring me you are emphasising that crucial link between peace and human rights, for which I am especially grateful,” she said. “I am convinced that this is a time when civil society world-wide, as never before, can make its voice heard. CityTalks takes place at the State Theatre, Market St, Sydney on March 17. The event goes from 6.30-8pm.